This 1996 live-action version of the animated classic based on the novel starring Glenn Close as the movie villainess is a brilliant adaptation and a film you can usually find on telly at one point during the year. Starting off as a romantic film about two dog owners, Anita and Roger (played by Joley Richardson and Jeff Daniels), who meet unexpectedly in the park (with a little help from their dogs) they soon get married and their dogs have a litter of puppies. These puppies come to the attention of the villainous Cruella De Vil (Glenn Close), in this version a fashion designer who was Anita’s former boss who wants to make the ultimate spotted coat and use Anita’s puppies for it. For anyone that hasn’t seen this film, first off – why not? Secondly, you should get your hands on a copy and watch it. It’s a brilliant family film, with some funny moments, adventure and best of all cute dogs and puppies. With this being a live-action version of the story, everything seems more real and realistic. A particular angle regarding the plan to kill the puppies, introducing a character, aptly named Skinner who illegally kills animals for their coats – he’s creepy and sinister and unfortunately a very real threat. The human actors are each brilliant in their role – particularly Glenn Close as Cruella – she’s perfect in the role. She’s a character that’s used to getting her own way, even if it means breaking the law – she’s cold, calculating and ruthless and Close is perfect at portraying this maniacal villain. Jeff Daniels and Joley Richardson are charged with bringing Roger and Anita to life, and are given more material than the animated movie gives to sink their teeth into. One of my favourite things about this film however, is the double team of Hugh Laurie and Mark Williams as Jasper and Horace. They are both hilarious in their respective roles and have a great chemistry together. They are not afraid to get stuck into physical comedy, but also have a great script filled with some funny moments to back them up. I don’t think I can end this review without bringing up the animals that were involved in making this film also; even though the film features a lot of dalmatian dogs there is also other breeds of dogs, farm animals, a cat, a horse, a racoon and a skunk. It also amazes me what trainers can get animals to do on screen, and particularly the dog actors; some of the facial expressions that the lead dogs playing Pongo and Perdita pull are beautifully heartbreaking, particularly when the puppies are first stolen. You can almost feel the heartbreak of the dogs as well as their owners. 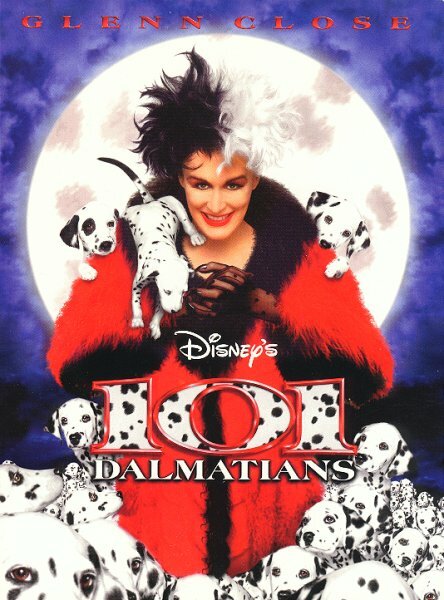 101 Dalmatians is a brilliant Disney family film, and still a firm favourite with me, albeit I am a dog person, so the film was always going to appeal to me. If you haven’t seen it though, I do recommend it – it’s brilliant for a Sunday afternoon, and it also has a live action sequel (102 Dalmatians) which is also worth a look in too! Cruella (to Jasper, Horace and Skinner: Congratulations, you’ve just won Gold, Silver and Bronze in the ‘Morons Olympics’! Horace: Who won the Gold? This Jerry Bruckheimer produced and Disney distributed film starring Nicholas Cage, Diane Kruger and Sean Bean is a treasure hunting, mystery-adventure filled with interesting historical information, and a fake conspiracy against the founding fathers of America. Ben Gates (Nicholas Cage) comes from a family who has long been searching for a mythical treasure that has been lost for centuries. After years of his family searching he’s getting closer but doesn’t count on his colleague now turned competitor Ian Howe (Sean Bean) also wanting the treasure and fortune for himself. Ben accompanied by his friend Riley (Justin Bartha) and historian Abigail Chase (Diane Kruger) he attempts to thwart Ian and also find the treasure. The movie is an old favourite of mine, and is a great family film to watch on an afternoon, with some comedic moments, great action set pieces and a movie that allows you to learn a thing or two about American history. And it also features Sean Bean as the villain, something the man has had a bit of practice at (that and dying). Avengers 2 Assemble!! !…And guess who’s coming back to the helm? That’s right folks, after announcing the obvious -that there will be an Avengers 2, Disney have now confirmed that Joss Whedon will be back to write and direct the film!! This is excellent news, given the way The Avengers performed at the Box Office, Whedon is definitely a good man to put at the helm of the sequel and it just means the world can experience more of Whedon’s utter genius.